Kristi Green is the author of the blog DC Wineaux. She further indulges her love of wine in her work at a wine bar on U St NW. 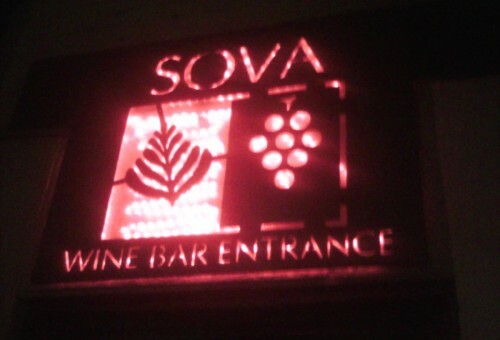 A gray, rainy day on H St NE; one long metro ride and a terrible cab ride later, I arrived at the tiny stairway that leads to SOVA Wine Bar. When I arrived, it was happy hour (5-7:30pm; all beer and wines by the glass half priced). I began with a glass of Punkt Genau Sparkling Gruner Veltliner (Weinviertal, Austria), a refreshing sparkling with a palette of green apples. 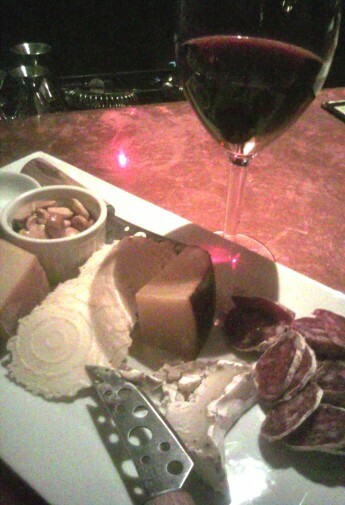 Feeling that post-bubbly hunger, I decided it was time for dinner—I entrusted the bartender, Amanda, to choose some cheese and charcuterie for me which I paired with a glass of Ravines Winery Cabernet Franc (Finger Lakes, NY). Their food menu is small, though apparently they are in the process of changing it for the Spring/Summer season–there is, however, enough cheese and charcuterie to make any wine nerd happy. There are twenty or so wines available by the glass and just as many bottled beers. Their signature cocktail list is full of classic staples (like the French 75, one of my favorites). On a chalkboard near the bar you’ll find a list of featured cocktails–I encourage you to try the “Spring Mary,” a prosecco-based cocktail featuring muddled heirloom tomato and basil. I rounded out the evening with a glass of Leone de Castris Salice Salentino (Puglia, Italy)–a robust Italian red with a great old world nose of leather and tobacco and a smooth palette of lush red fruits. This was the perfect pairing for finishing my cheeses and salt-and-pepper salami. The bar is small and cozy; the walls are red and the furniture is a cross between a cafe in Monmartre and your hip aunt’s living room. As I devoured my three delicious cheeses, charcuterie, crostinis, olives, and almonds a jazz band with soft lyrics (all in French!) droned on in the next room. The staff are warm and friendly–there is a pretty clear set of regulars but, never fear, these aren’t the territorial sort–all in all SOVA made me feel right at home. As they were having some menu complications, I did not get to try too much of the food but I look forward to going back to try their new menu items. SOVA is an ideal spot to relax with a book or your laptop while enjoying some light fare and some great wine. Wineaux dream dinner @ SOVA: From left to right: Piccolo (cow’s milk cheese, Italy); Marcona Almonds (Spain); Dante (sheep’s milk cheese, Wisconsin); Salt & Pepper Salami (pork; Italy); Truffle Tremor Cheese (goat’s milk cheese with black and white truffle; CA); not pictured: assortment of organic olives; paired with a glass of Ravines Winery Cabernet Franc (Finger Lakes, NY–tasting notes below). a heaping platter of cheese and charcuterie from SOVA! this wine was particularly excellent with the Truffle Tremor!